June | 2014 | Extollagy! Preparing for a Glastonbury dayschool, I’ve been able to revisit some of my thoughts on Unpacking Glastonbury (https://joncannon.wordpress.com/2011/06/03/unpacking-glastonbury/). In a funny kind of way, I’m less exercised by the origin of it all than one might expect. What do we know? That there was some reasonably serious Roman activity on the site of the abbey. One would expect there to be Christians among such people by the C4; here we certainly know there were Christians in the Somerset area. That in the C5/C7 the Tor site was a centre of power that still maintained awareness of, and was able to trade with, Mediterranean cultures. That the first historical church on the abbey site, Ine’s church of the early C8, is clearly oriented on an existing structure (and arguably an associated well) which remains the tap root of the entire complex from then on; that by Dunstan’s time the legend of a special origin had developed. All the business about miraculous/crypto-Biblical origins is recorded much later, and is by-the-by: I see no problem with the proposal that there was already something on the abbey site that people in the C8 might understand as being special for some kind of antiquity or earliness; that is, proposing a Christian *something* of say the C3-C5 (say starting as a place of worship in a villa and persisting into something more self-consciously a religious community or cult site as Rome itself recedes), is not quite putting 2+2 together to equal 5. 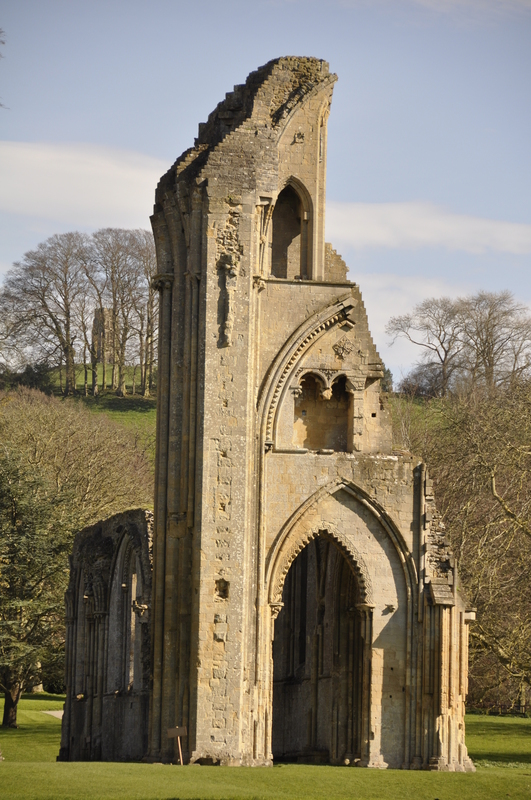 Hell, we even have archaeology for such continuities in the area, barely 10 minutes drive away at Glastonbury’s great rival Wells, where there are no legends at all — but plenty of proof of just such a sequence, with the present cathedral its final result. Many have taken all this further, and I’m going to resist the temptation, except to additionally point out that, if the power-centre on the Tor was a scene of resistance to the Anglo-Saxons (no evidence, but reasonable supposition); and if local leaders/kings (call them what you will; and leaving aside whether the Tor site was religious or secular) were traditionally buried next to the Christian-thing on the abbey site (again, the Wells Christian-thing was a place of high-status burial); that would be easily enough for people of the late C12 to dig one of these burials up and call their find Arthur. But in a way what interests me is what happens thereafter: how all these rolling mythological/hagiographical/pseudo-historical stones keep rolling from the C11/12 to the present, bumping into each other, swapping hoary mosses, like an enormous communal, sacral game of Chinese whispers. I’ve outlined that story in my previous post; but this time round I’m struck even more by Glastonbury’s oddnesses. It’s reputation as a mighty centre of sacredness has come down to the modern world vital and intact; yet the medieval story is more strange and contradictory than that. 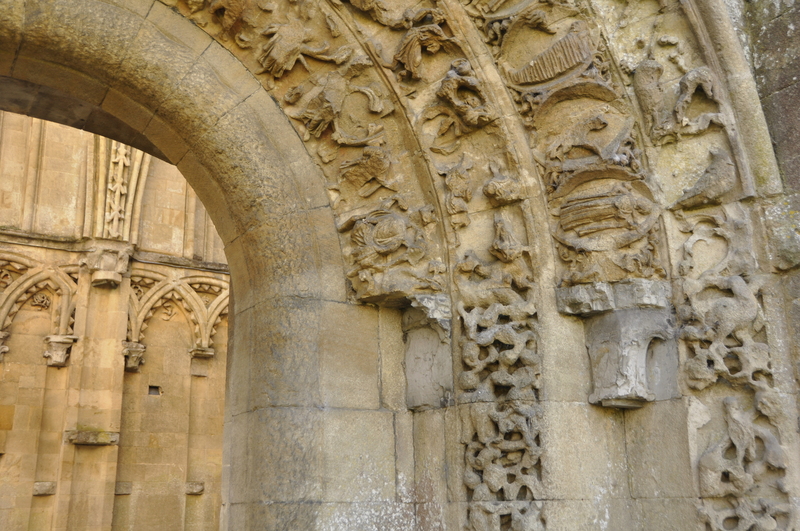 Glastonbury abbey: south door and interior of the sacred Lady chapel. Finest work of sculpture of the 1180s? Firstly, there is something restless, almost insecure, about all these rolling hagiographical stones. Our Ancient Christian Thing is the absolute nub of that, morphing from Vetusta Ecclesia to standalone Lady chapel to combined Lady chapel/chapel of All Saints to chapel of St Joseph over four hundred years, even as the stories of its origin get gradually more outlandish. There is a whole cultural history here, from the context of the C12 events in the rich culture of Anglo-Norman England and the ‘Twelfth Century Renaissance’ to the late phase, where the hollowing out of its crypt to create a new, tomb-like devotional focus and the visceral associations with the man who project-managed Christ’s burial is powerfully redolent of late medieval religious culture. The point being that Glastonbury cults have an oddly fluid quality. What is this Vetusta thing? Not a saint, exactly: it’s a structure, a vessel, a receptacle: that’s what sacred spaces do. No wonder it’s so fluid. Do we have Patrick, or is he in Ireland? Dunstan, or is he in Canterbury? Is Arthur a saint? Has anyone ever heard of this minor host of Celtic saints and Wessex kings? The contrast with mighty Cuthbert or Etheldreda (or later, Thomas of Canterbury), iconically bestriding their respective communities, is curious. What did this place actually mean? Secondly, Glastonbury has a curious way of consigning its own story to oblivion. The astonishing, casket-like richness of the Lady chapel (and equally astonishing scale of investment by the king in 1184-9 — shades of Westminster abbey sixty years later) is at once deeply a fireproofed recreation of its feted predecessor and a consignment to oblivion of all trace of it to; if any sign of that remained below ground, it was in turn vapourised by the hollowing out of the chapel’s crypt in around 1500. It’s patterns like this which fuel the remarkable story since, in which small-scale, organic features of the abbey’s (remarkable) surrounding landscape – a thorn tree, a well – features which have the slenderest evidence for mattering to anyone particularly before the early C16 — become the fuel for the twisted (in the sense of complex and knotty) resacralisation of a Dissolution-shattered landscape from the C19. There is, then, something going on here throughout about forgetting, or half-remembering; something as analgous to sleep and its dreams as it is to real history. 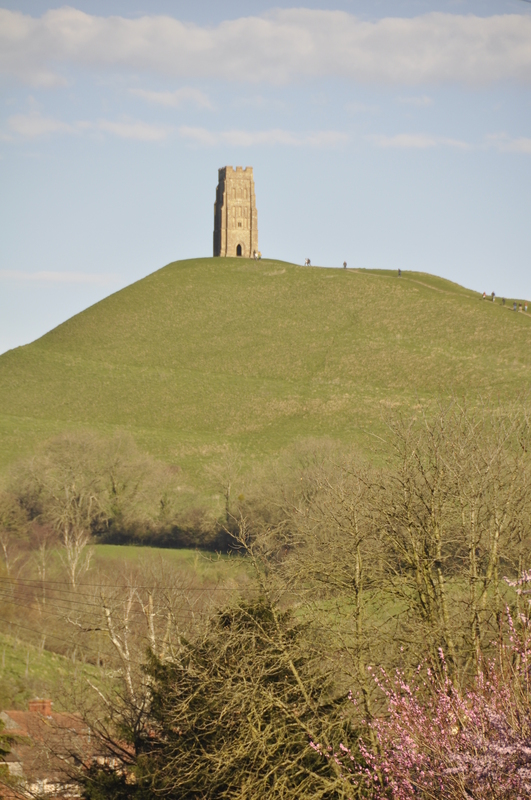 Glastonbury Tor, with the tower of St Michael’s church: dealer in myth since the C5, or before? Back to my theme. There is another aspect of Glastonbury that’s oddly overlooked, and that is the art-historical significance of what does survive. We actually know a fair amount about this building: Bligh Bond and Harrison are unfairly vilified, if over-enthusiastic in filling in the dots; Jerry Sampson is doing heroic work as I write. Firstly, the Lady chapel is arguably the most drop-dead work of small-scale architecture of the febrile 1170s-1200s, as significant in its way as Canterbury, Wells, Lincoln (or, perhaps its closest comparator, the Durham Galilee). Secondly, the great church, also designed in 1184, is no strippling. It has the last in the great sequence of C12 Giant Order elevations, always a little too clever for their own good: is that because the previous church, ie the early/mid C12 one had one, too? (shades here of the relationship between post-1173 Canterbury and Anselm’s east end) In the mid-C13 we have a west front and a functionally intriguing Galilee that might have looked Wells in the eye for richness of articulation — and contextually from here on a fascinating sequence of events around an image of Mary from the Old Church that had been miraculously preserved in the 1184 fire. Not to mention all those other rolling stones. The consequences of some of this are the biggest gap of our knowledge: given the significance of late C13/ec14 architecture in this part of the world, the loss of the north porch extension, the nave and galilee vaults, de Taunton’s pulpitum, etc is a tragic one. Even more so as Monington’s work in the choir was arguably one of the most significant and ambitious early essays in Perpendicular, applying the grid idea to the existing church with a determination that can seem almost extreme, given the way it must have left the C13 clerestory as a series of dark holes. It could be 1340s, astonishingly early; it is unlikely to be latter than the late 1360s (Monington dies in 1375), which still makes it the first Perp great church after Gloucester (neck and neck with Winchester); indeed Gloucester is itself only just drawing to completion. Equally impressive is the careful late C12/C13 retrospection of Monington’s retroquire, arguably a model for that other remarkable piece of backwards-architecture, Yevele’s Westminster nave (Westminster-Glastonbury is almost as fun a riff as Wells-Glastonbury — don’t get me started). After that, evidence continues, but assessing significance gets more problematic: the Renaissance inflections mooted for the Loretto chapel seem to be entirely invented; the palpable links between the Edgar chapel and the Gloucester and Westminster Lady chapels make the proposal that it was an exceptionally rich structure convincing; the archaic design of the Lady chapel/Galilee crypt/s is fascinating — but also, prosaically, a very similiar design to that of the lost dormitory undercroft. There is much to learn.